The rich, smooth tastes of two caffeine-free African herbs - honeybush and Rooibos - are perfectly complemented by the summertime style of pineapples, bananas and other refreshing tropical tastes. 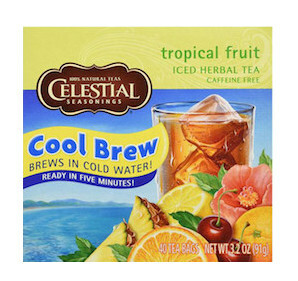 Take the bite out of the heat of summer with this refreshing, caffeine-free blend. Ingredients: Rooibos, hibiscus, rosehips, orange peel, natural tropical flavor with other natural flavors, roasted chicory and citric acid.